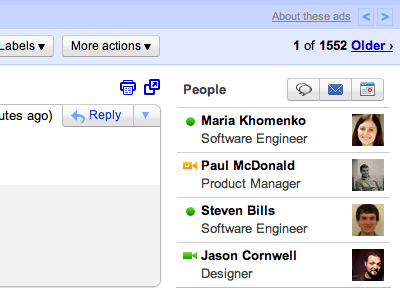 Today we’re excited to graduate three more features from the experimental testing ground of Gmail Labs. Superstars, Nested Labels, and Advanced IMAP Controls are now first-class citizens in the Gmail world, thanks largely to your feedback. We’re also retiring the Google Search box lab which was redundant with the “Search the Web” button that’s already in Gmail. Once you’ve done that, the stars will rotate with each consecutive click on the star icon. 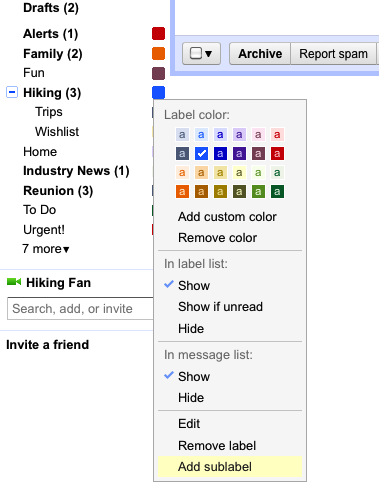 Labels are a great way of organizing your email; nested labels give you the ability to organize labels hierarchically. Starting today, nested labels are enabled for everyone along with a couple of small improvements such as a sticky collapse/expand state and better editing options. This Labs feature provided a very useful set of advanced controls for those of you who access Gmail through IMAP clients (e.g. Outlook, Thunderbird, or your iPhone’s native mail app). Now it’s easier to take advantage of features like syncing only selected labels or limiting the folder size limit to improve your IMAP experience. True to the original spirit of Gmail Labs, we’ll continue to add new features, graduate some, and retire others, so keep trying them out and sending us your feedback. Email is just as much about the people you communicate with as it is what you communicate about. We think it can be helpful to view relevant information in context, which is why over the next two weeks we’re rolling out a new people widget located on the right hand side of your messages. The people widget surfaces content from friends, family and colleagues that is already available to you but may be hard to find and makes it easier to connect with them. Next to every email message you can now see contextual information about the people in that conversation including recent emails you received from them, relevant Buzz posts, shared documents and calendar events. You also have quick access to a variety of ways to communicate with individuals, start a group chat or schedule a meeting with groups of people. 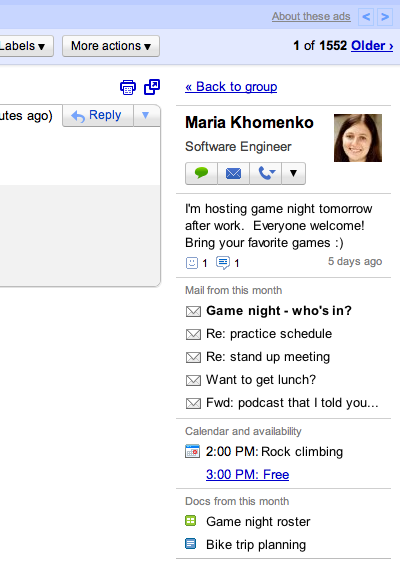 Update (6/10/11): We're still rolling out the people widget to everyone. If you don't have it yet, you should within the next couple weeks. Thanks for your patience! From the beginning, we designed Google Talk using open standards so that you could connect to your friends and family using any chat product, making communication as easy as possible. A few years ago, we announced our partnership with AOL which made it possible for people to chat with AIM users right from inside Gmail. Today, we’re happy to report that AOL has now made it possible to chat with AOL contacts across a variety of Google services: not just Gmail, but also iGoogle, Orkut, and Google Talk on Android phones. If you chat with AIM buddies in Gmail, you’ll notice a few changes. First, you’ll no longer need an AIM account to connect to your friends using AIM. Instead you’ll be able to add your AIM buddies just like you add Gmail contacts to your chat list: using their AOL screennames (for example, username@aol.com). 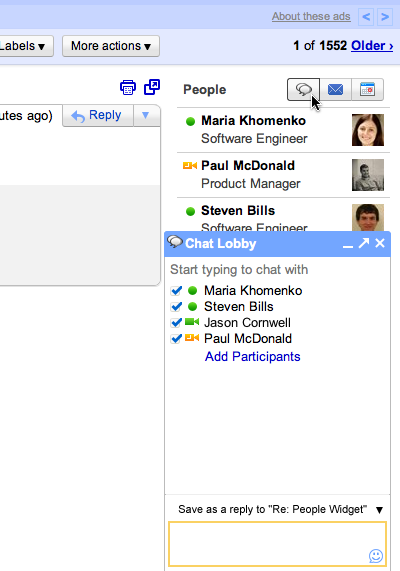 AIM users will now also be able to add Google contacts to their AIM chat clients. Second, you’ll no longer be able to sign into your AIM account from within Gmail chat since you can now add AIM contacts directly. 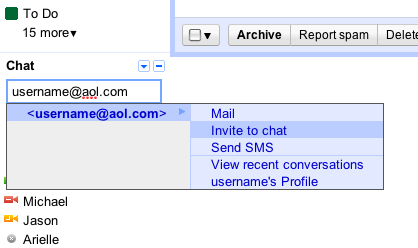 And lastly, if you previously had a lot of AIM contacts and don’t want to re-add them to your chat list one by one, AOL has created a tool to import your AIM buddies into your Gmail account. See their blog post for more info. 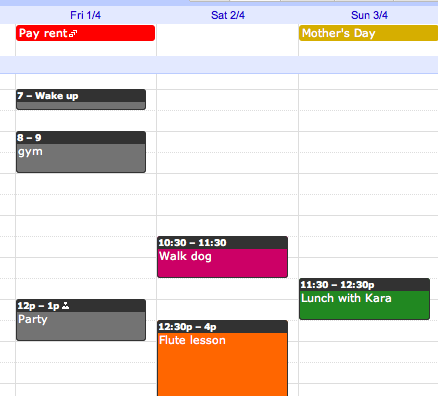 If your calendar ends up full of many different types of events (film nights, lunch dates, and doctor appointments, for example), there’s now an easy way to categorize them using colors. Just click on an event, then click the colored square in the top left of the pop-up bubble and pick a new color. If you don’t see this option quite yet, hang tight — it'll be there for everyone within the next day or so. 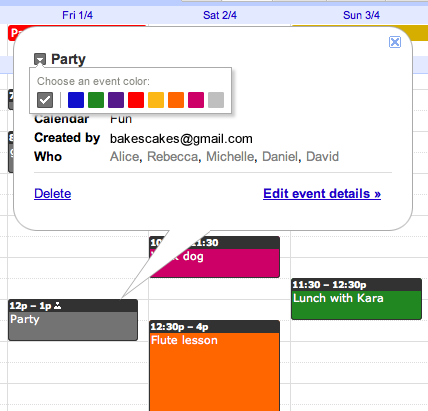 Only you and anyone else you’ve given edit access to your calendar will be able to see the colors you choose. This has been a feature request from many of you for some time, and we hope you enjoy using it as much as we do. 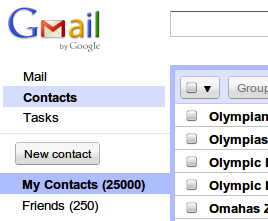 Gmail used to have a limit of 10,000 contacts. For most of us, this was way more than enough, but we heard from some of you who use Gmail to communicate with more than 10,000 people. We want you to be able to store all of your contacts in a single place, so starting today, we’ve increased the limit for all Gmail users, including all those of you who use Google Apps, to 25,000 contacts. Also, previously an individual contact could be no larger than 32KB — big enough for most people, but not always sufficient for those who like to keep a lot of notes on individual contacts. Now, each contact may be up to 128KB in size, allowing you to store more information in the notes field. Gmail offers a ton of customization, and when you get hundreds of emails every day it’s crucial that you have it set up to process mail quickly and efficiently. Working on Gmail, I get asked all the time what settings and features I use to help me power through my mail. Rather than answer my friends and co-workers one by one, I thought I’d put it all into a blog post. So here goes. Turn on Priority Inbox. I couldn’t live without Priority Inbox. I keep the default set-up with important and unread mail at the top of my inbox and the section for everything else at the bottom. Show more than 25 conversations in your inbox. I like to see as many emails as possible per page so I can quickly scan through my mail, so I have this set to 100 (the max possible). Go to Gmail Settings and look for “Maximum page size” which you can change to 25, 50, or 100. Enable keyboard shortcuts. Press the “?” key when looking at your inbox to see the list of keyword shortcuts. Make sure they are turned on, then pick one or two to start with and try to learn more as you become comfortable. I probably use ‘e’ to archive my messages and ‘j’ and ‘k’ to move through messages the most. Inbox preview: Shows a simple, static preview of your inbox while Gmail is loading. While you can’t take action on the messages until your inbox fully loads, it’s great to get a sneak peek and form a plan of attack. Send and archive: Adds a button that lets you send a reply to a message and archive the conversation in a single click (keyboard shortcuts work well with this one, too). Background send: Lets Gmail send your mail in the background while you move on to more important things. Auto advance: Automatically shows the next conversation instead of going back to your inbox after you delete, archive, or mute a conversation. When combined with the “Send and archive” button and background send, this feature makes reading and replying to messages lightning fast. Try out this set up and let us know what your favorite features are.